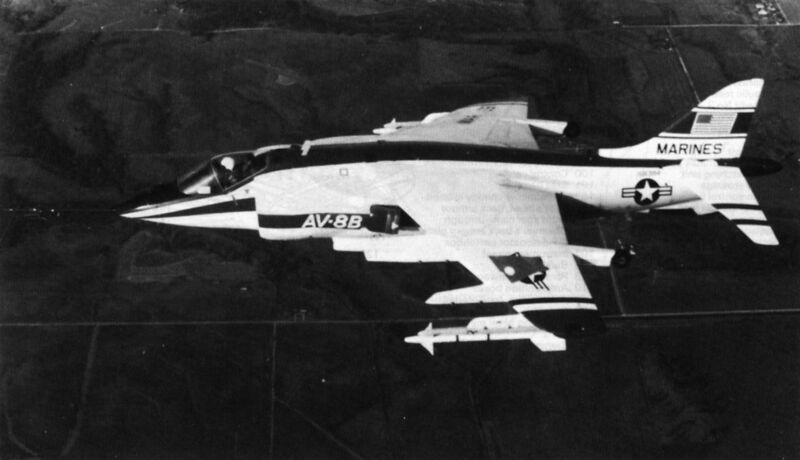 The first of the two YAV-8B prototypes, converted from AV- 8A airframes, showing a typical weapons load including bombs, gun pods and Sidewinder AAMs. 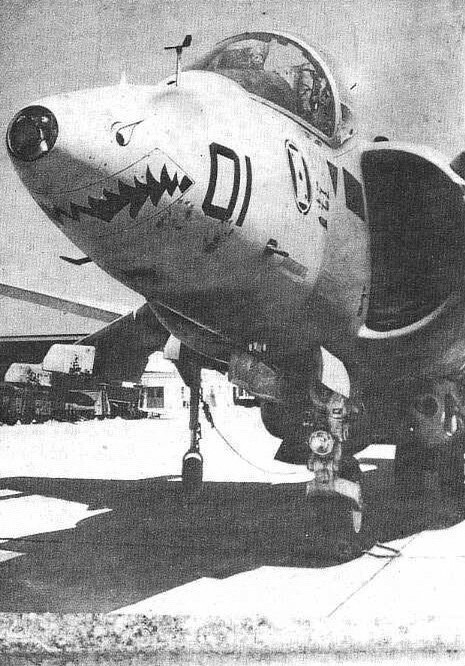 The latest derivative of the original Hawker P.1127, the world's first and to date only completely successful V/STOL combat aircraft, is the AV-8B, developed by McDonnell Douglas for the US Marine Corps and first flown on 9 November 1978. Прототип YAV-8B взлетает с трамплина. 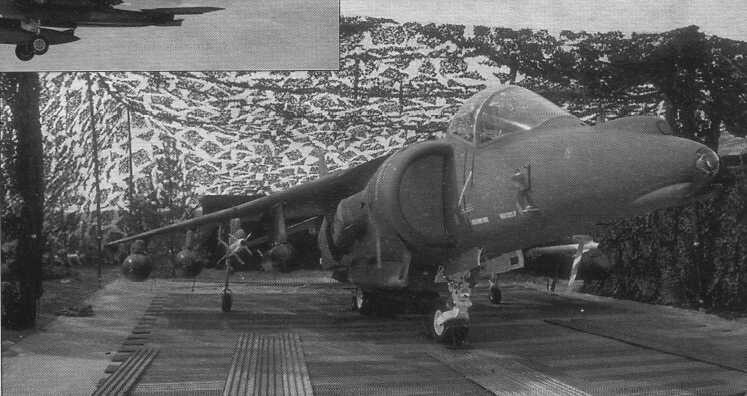 McDonnell Douglas AV-8B Advanced Harrier. 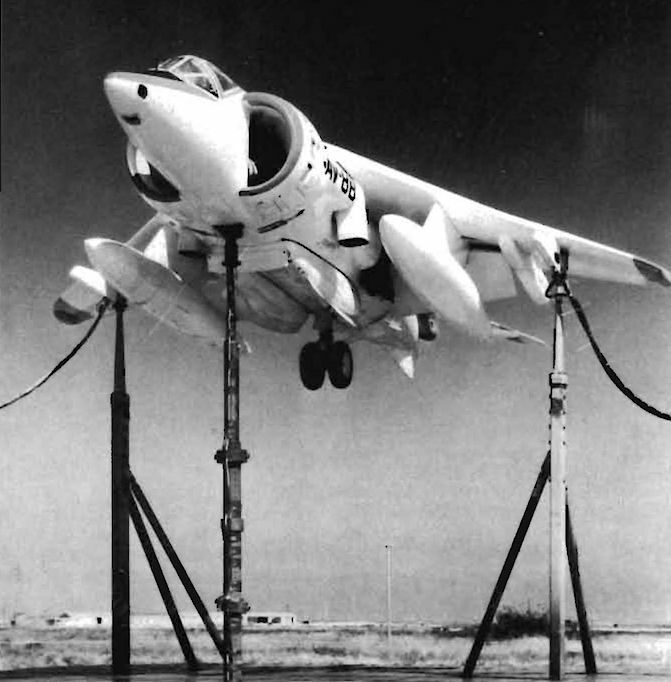 The McDonnell Douglas 279 project is an extrapolation of experience gained with the Harrier. While such advanced supersonic projects await funding, NASA is planning a more modest research programme to simplify V/STOL flying, using the original YAV-8B prototype. 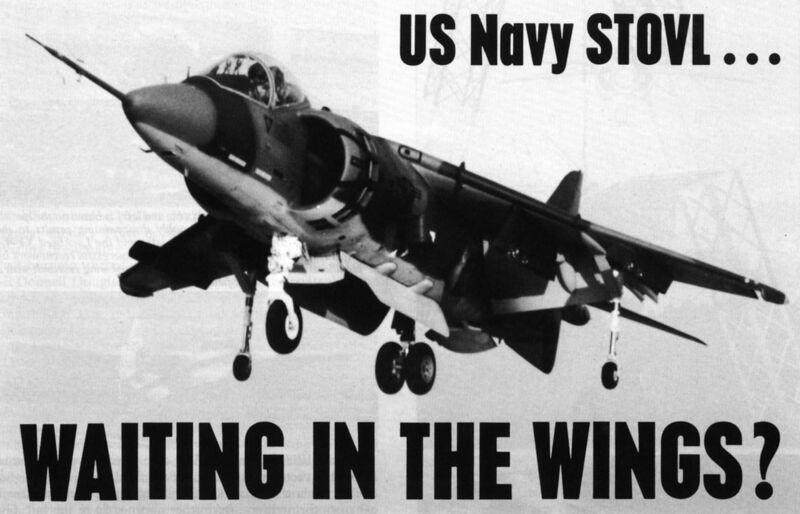 Air International 1983-02 / B.Sweetman - US Navy STOVL ... Waiting in the wings? 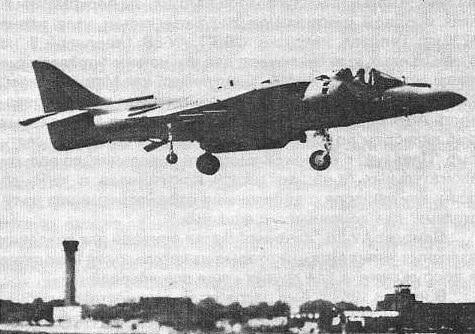 The first of the two YAV-8B prototypes flying with leading-edge extensions - slightly larger than the final form adopted for the AV-8B. 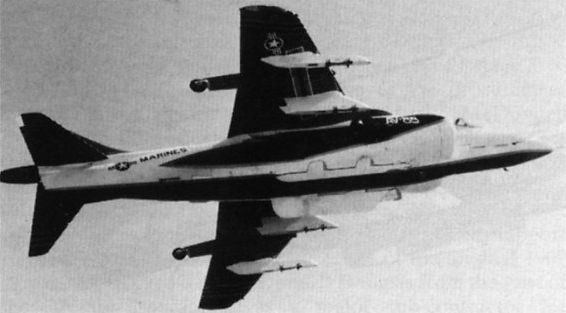 The second YAV-8B prototype in flight; this aircraft was later lost in a non-fatal accident. 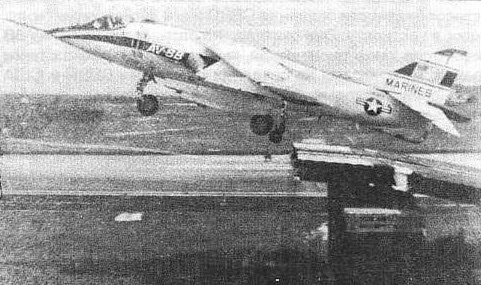 Photographed during its first take-off on 5 November 1981, this is the first of four full-scale development prototypes of the AV-8B. On this photograph, it lacks the leading-edge extensions that will be a standard feature. Photographed on the occasion of its roll-out at St Louis, this is the first of four full-scale development prototypes of the AV-8B. On this photograph, it lacks the leading-edge extensions that will be a standard feature. A red, black, gold and while colour scheme on FSD 2 helps the position of control surfaces and aircraft attitude to be clearly distinguished during tests. 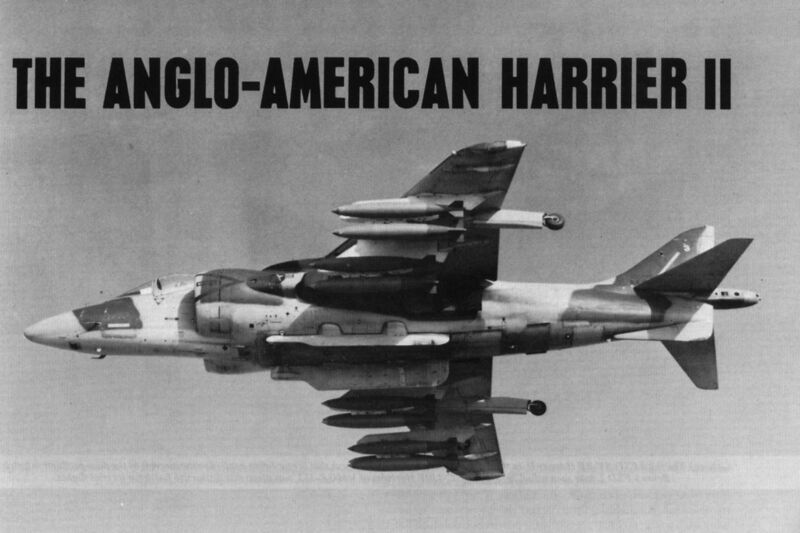 The third of the four Full-Scale Development AV-8B Harrier II, shown with two long-range tanks. 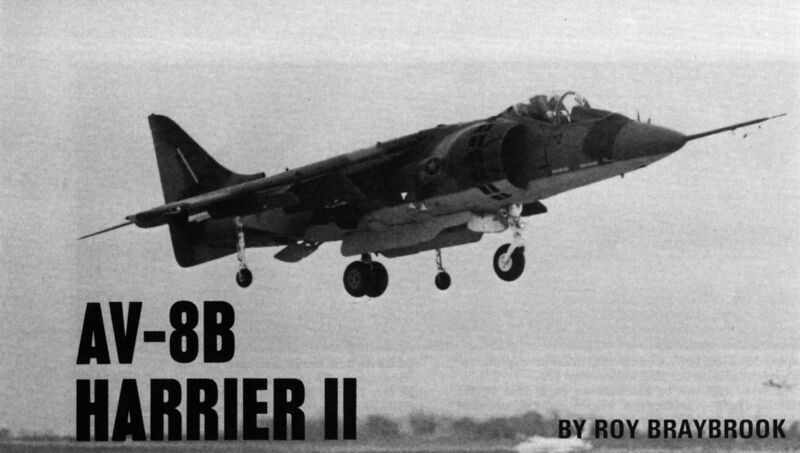 The first of the pilot production batch AV-8Bs for the US Marine Corps, which has plans to acquire 328, including 28 of the two-seat TAV-8B variant. 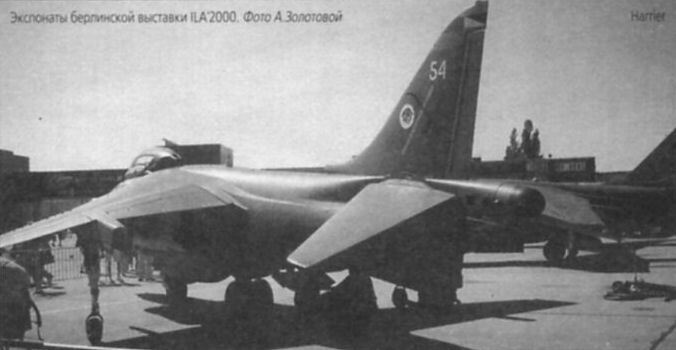 AV-8B командира эскадрильи VMA-231, июнь 1991г. 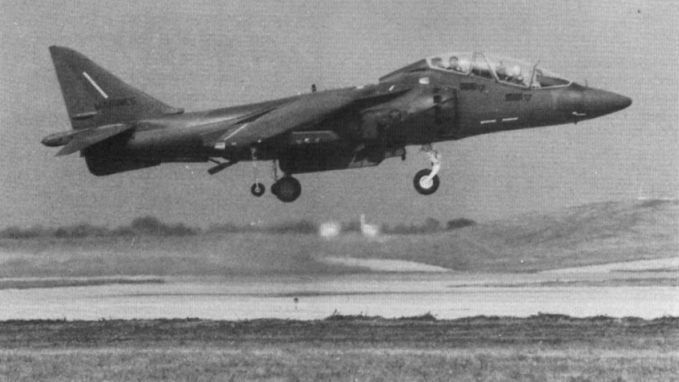 On 6 October 1987, the first three of 12 EAV-8B Harrier IIs ordered by the Arma Aerea de la Armada arrived at the Navy’s base at Rota after a non-stop ferry flight from St Louis, being refuelled en route by a USAF KC-10 Extender. To be based aboard the new carrier Principe de Asturias, the EAV-8Bs will equip a new Escuadrilla. AV-8B из эскадрильи VMA-542 после возвращения из Саудовской Аравии, июнь 1991г. Первый GR.Mk 5 поднялся в воздух 30 апреля 1985 года. От американских AV-8B его отличали новые катапультное кресло и шины колес шасси, специальный пилон для ракет Sidewinder и британская авионика. Светлой окраской обозначены секции, построенные компанией "British Aerospace". 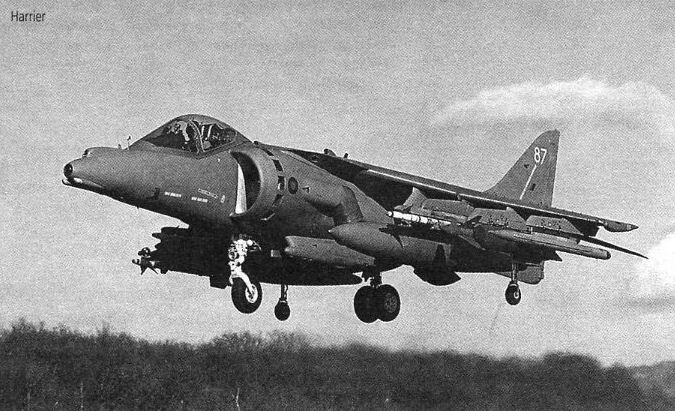 The first Harrier GR Mk 5 effected a successful maiden flight from Dunsfold on 30 April, 1985. The first flight, with chief test pilot Mike Snelling at the controls, lasted one hour. 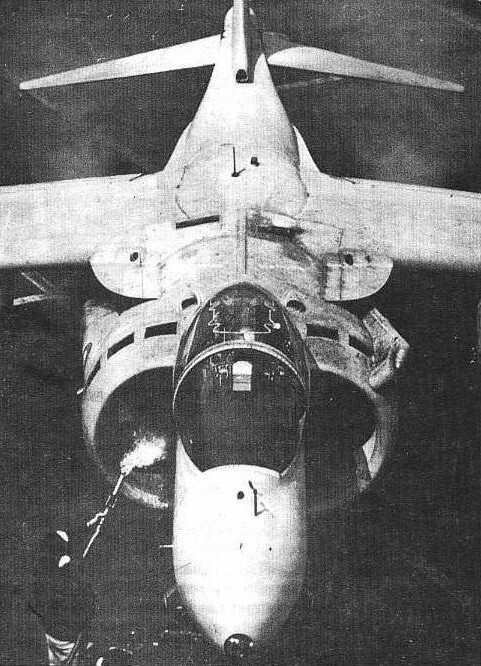 Note the "deep strokes" beneath the fuselage, which will eventually be replaced by 25-mm Aden cannon. Британский истребитель-штурмовик вертикального взлета и посадки "Харриер GR.7" на итальянской авиабазе Джойя-дель-Колле. "Харриер" GR.7 (3-я эскадрилья) и "Торнадо" F.3 (23-я эскадрилья) выполняют демонстрационный полет в Малайзии, сентябрь 1992г. 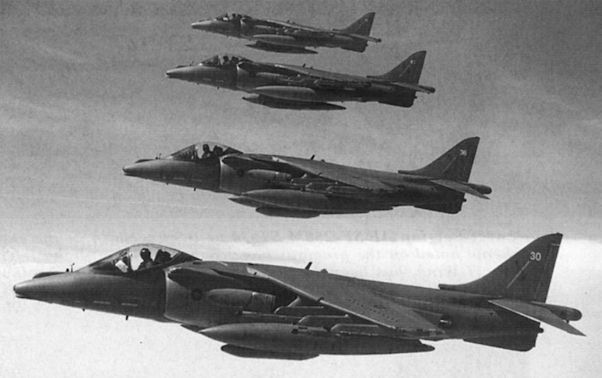 The four Harrier GR.7s en route to Italy on May 7, 1999. Первый вылет Харриера II PLUS (164129) 22 сентября 1992г. 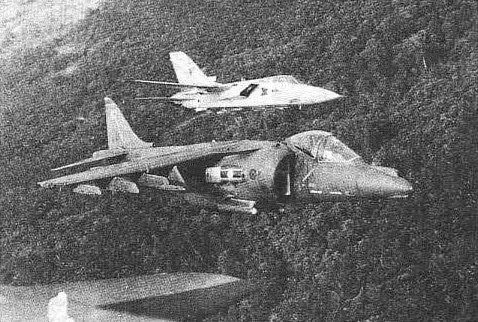 Harrier. Экспонат берлинской выставки EA'2000. 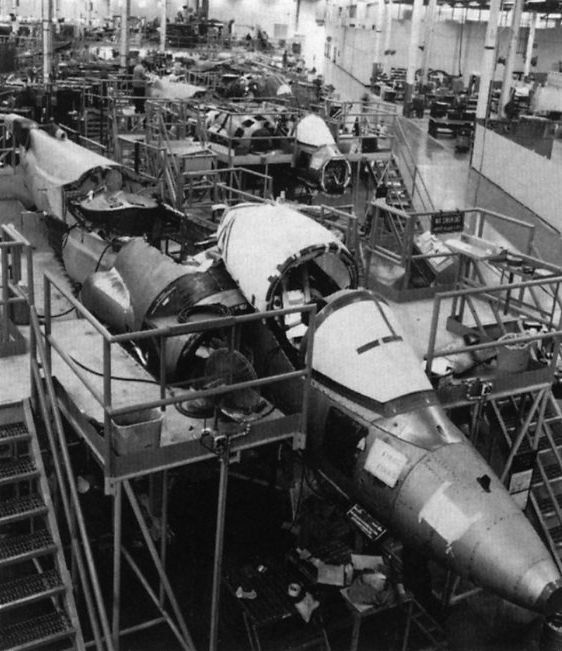 The AV-8B Harrier II fuselage assembly line at St Louis, where British-built centre/rear fuselages are mated with McDonnell Douglas-built front fuselages. 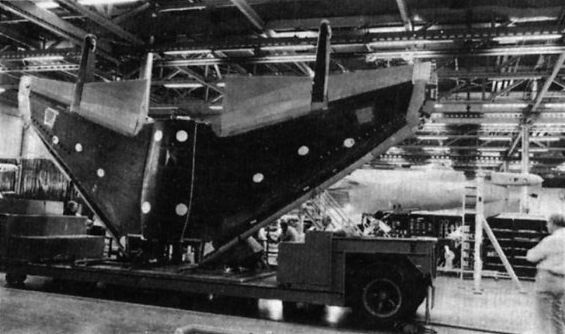 The upper skin of the AV-8B wing, laid up on a mobile platten, enters the autoclave at St Louisfor curing. 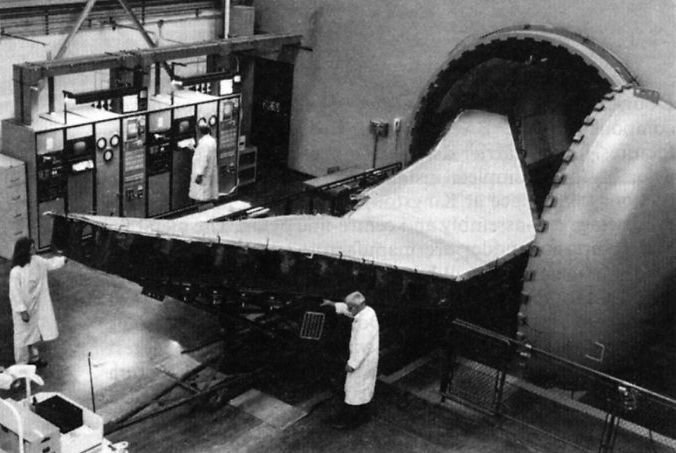 A completed wing - the largest piece of all-composite primary structure to have reached quantity production.